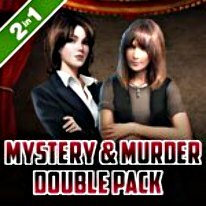 Enjoy two games filled with drama and intrigue in this exciting double pack! In Farm Mystery, residents of the local town are mysteriously disappearing into the mist that enshrouds Happy Orchard Farm at night. Is there an innocent explanation or could the farm at the mercy of supernatural forces? In Eastville Chronicles The Drama Queen Murder, there's been a murder in the world famous Eastville Opera House.As the new crime investigator in town its your job to unravel this tale of love, passion and intrigue to unmask a murderer. Interrogate suspects, search for clues and run DNA checks. Find fingerprints, hair samples, and a mask. Who wore the Scaramouche?